The sight of a splendid white La Marzocco machine at one bench and a bench full of pastries and cakes at another was enough to momentarily snap me out of some incredible jetlag. We had just arrived in The States with a few hours in LA before getting back on a plane to Boston and my amazing cousin had picked us up and brought us to heaven on earth. Not one of us had been for brunch this early in memory. We were so early we had to wait until 9am to see a brunch menu. We waited in the knowledge the pastries and cakes would not be going anywhere! Besides, the coffee was enough for now. Really beautiful deep savoury espresso. I was at home on the other side of the world at Superba Food + Bread. The airy cafe is carefully designed, glass with green frame combining with wooden beams in another version of stripped back warehouse, with plenty of seating outside too. Behind my back I hadn’t noticed how busy it had gotten as we chatted to my cousin. She had earlier spotted Nicole Richie but that was nothing compared to hearing some stories of a famous rock band she met in Nice just weeks before! We turned to the menu and it is split into toasties, breakfasty things and lunchy things. Sascha chose from the toasties, getting an open scrambled with cheese that she said was great. Catherine had the breakfast sandwich which had a beautiful slow cooked egg, delicious linguica sausage, braised kale, and pain au lait. I almost ordered that too but instead went for Paul’s Big Boy Breakfast. 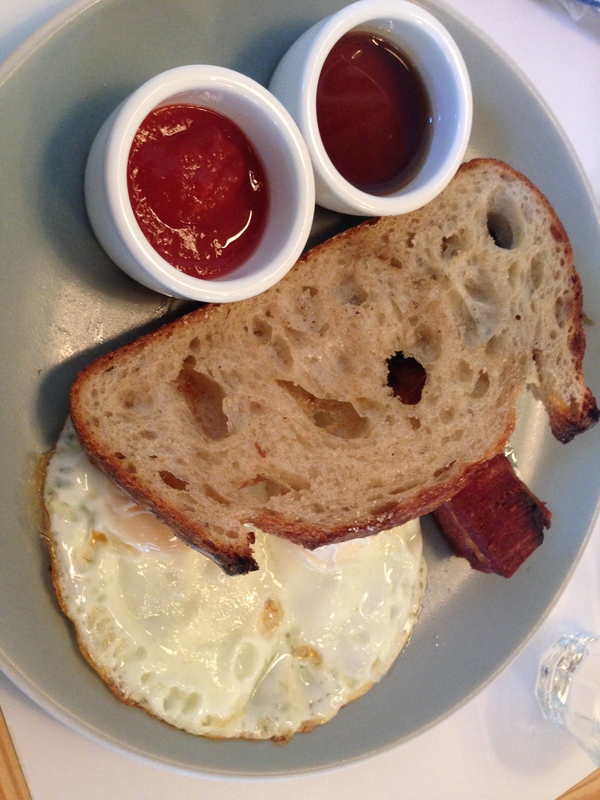 The big breakfast was two fried eggs, a large piece of sourdough toast, bacon steak, kale, hot sauce and maple syrup. The sauces came separate which was good and the hot sauce had particularly good punch that became addictive with the eggs. The bacon steak was smoked beautifully to get a deep flavour, classing up from the usual. The service was helpful and relaxed, and the personality of the cafe was confident – assured of the quality on offer. 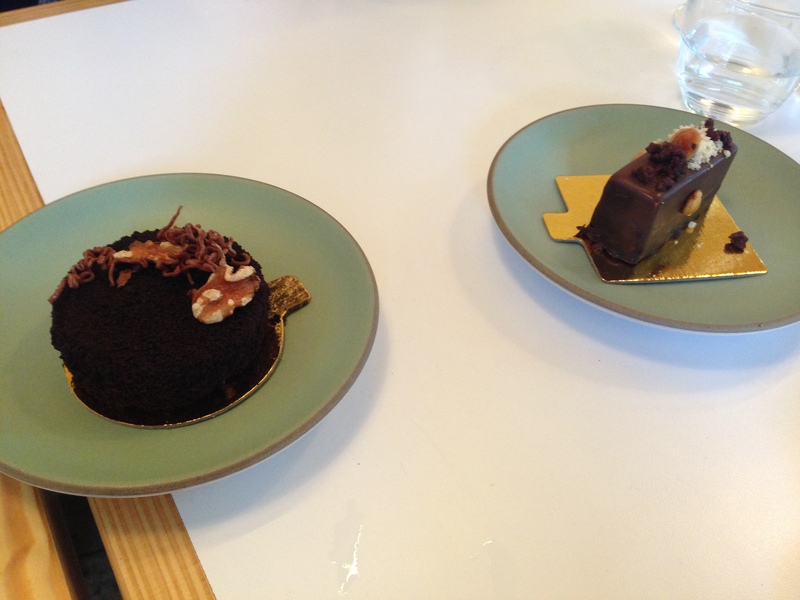 The pastry chef explained the cakes on offer at the front in detail and I was sold. It was 10am in LA but late at night in Melbourne so there was no guilt in ordering a sparking wine! As we finished off our glasses we all shared two cakes. The Chocolate Delice was described as decadent and indeed it was with salted caramel oozing out of the chocolate exterior. The Superba Candy Bar was the best though! Layer upon layer of chocolate, soft and inviting, and melting away delightfully with each bite. On a perfect sunny morning it was easy to see why the crowd had flocked here but I have the feeling that it would be just as inviting on a cold wintry day. Brunch is a completely different meal over here in New York than the all day breakfast that is the norm of Melbourne. For starters, The Stanton Social doesn’t even open until the very civilised time of 11am, which happens to be about the time we normally go for breakfast anyway. What we didn’t quite realise is that TSS has a menu that is all about sharing rich morsels of loosely breakfast type food. Sharing around five dishes for two people is recommended, but when we viewed the size of the portions, and the rich flavours being amplified in each dish, we settled on three. 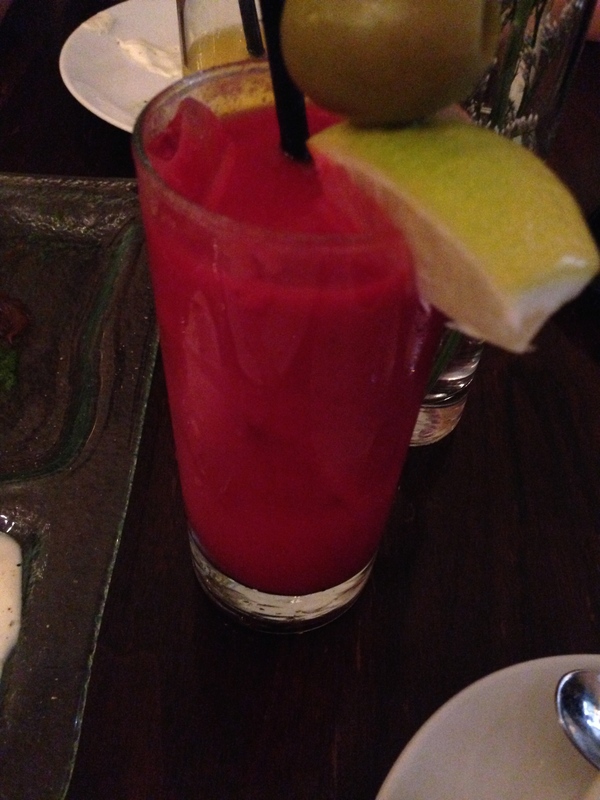 I ordered a Bloody Mary which uses fresh tomato pulp and it was different in a good way. The double espresso I also ordered was different in a very mediocre way and I realise that brunch is not all about coffee the way I’m used to. It happens that instead of ordering any more coffee I tried El Ray across the street which had a terrific blend, producing an espresso with depth and savoury hues. Catherine was served her sweet freshly squeezed OJ and we started on our first dish of pierogies filled with potato and goat’s cheese, topped with caramelised onions, with a sauce of truffled creme fraiche. The pierogies were not as soft as I expected but were a delicious start. 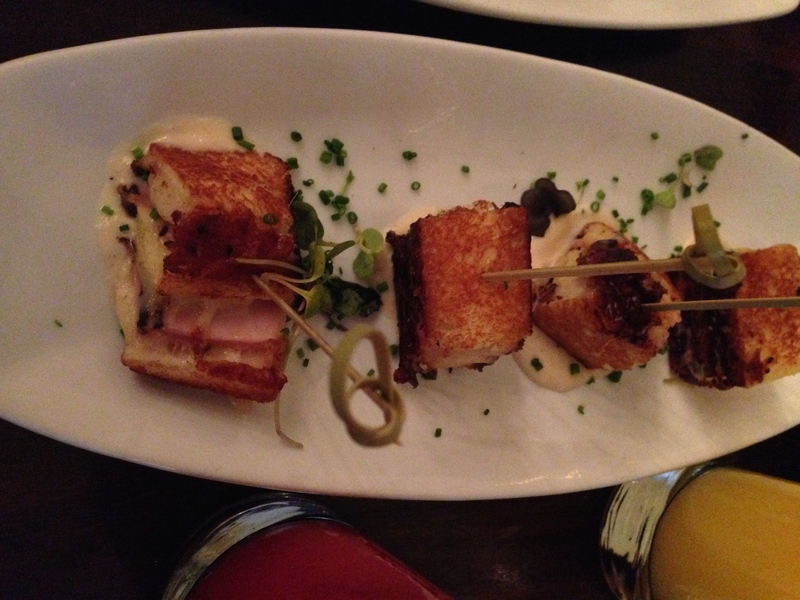 Next we turned to my favourite, the croque monsieur satays which could not be any more decadent. The muenster and gruyere cheeses were all encompassing, but not overpowering the ham and brioche, the later still maintaining its shape. 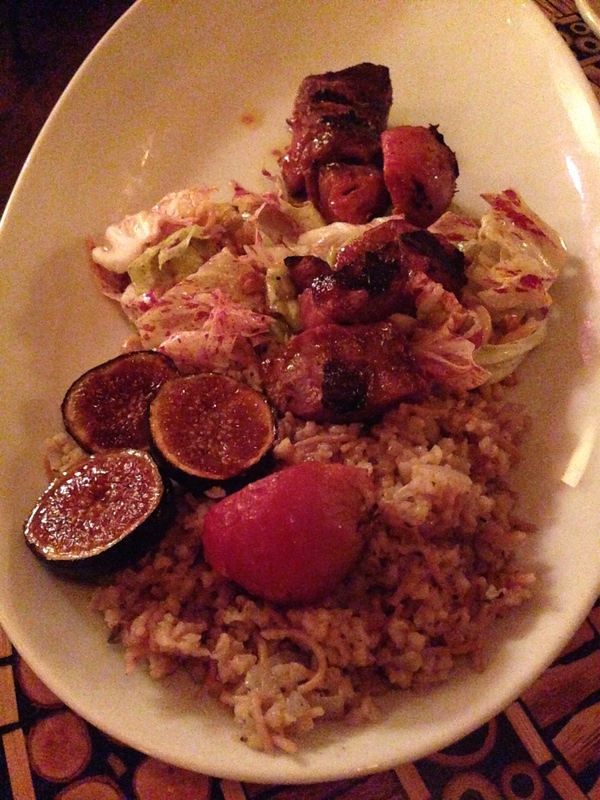 It was the kind of dish you want to be able to eat again tomorrow, but only a small taste each time! 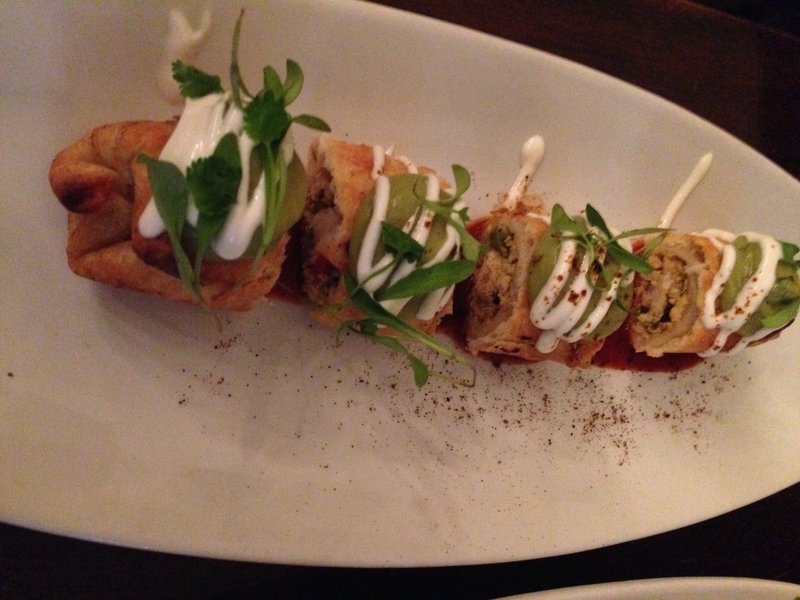 To finish we tried the chicken taquito which was the most normal of our dishes featuring good flavour from the chicken minced with spices, the red pepper sauce, and tasty guacamole rounding it out. As you look around at the staff and customers you know this is one of the hip places for brunch in New York. If the sun went down you could easily see TSS transform into a vibing bar with no effort at all. It is a cool place that would be fun to see back home, but seems special to the big apple. Early reservations is something I do so regularly that there is a good proposition I’m going to have a smooth transition into my older years. Normally it is to secure a booking or have time to go out later. This time I’m second guessing myself as we walk through a pumping bar area and front dining room to an almost completely empty room at the back. The four of us sit down and by the time we’ve ordered some drinks and are having a chat reading the menu, the back dining room at Saxon + Parole is pretty much full and the second guessing is gone. It seems the airconditioning is either on (freezing) or off (okay) rather than temperature controlled, but that will be my one and only criticism of the entire evening. Food, wine, service, and company, could not have been better for our catch up and celebration with friends. 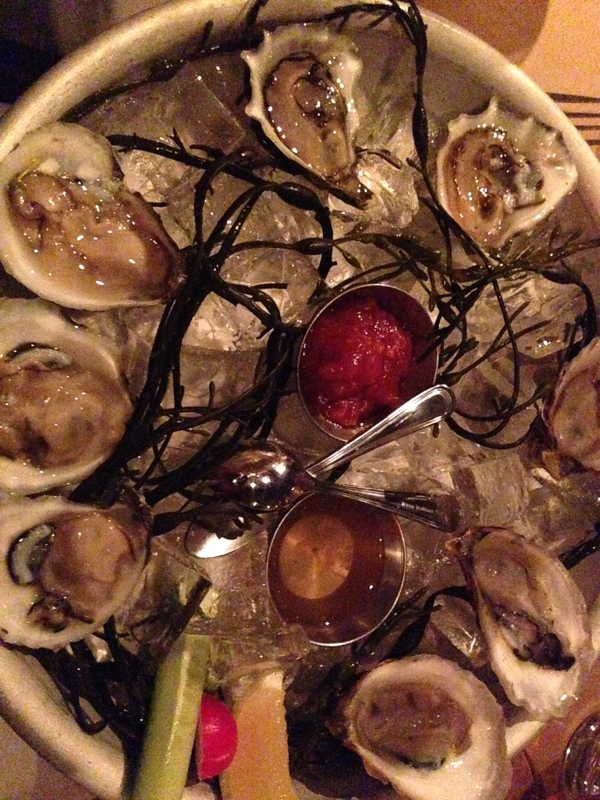 The menu is focussed on meat options for entrée and several modern starters that can be easily shared, including an impressive list of oysters. That is what takes my fancy and I try two sets of three from different places on the East Coast that produce smaller, more flavoursome, and less creamy varieties. They are so good I forget to even once try the vinegar, lemon or chilli accompaniments. 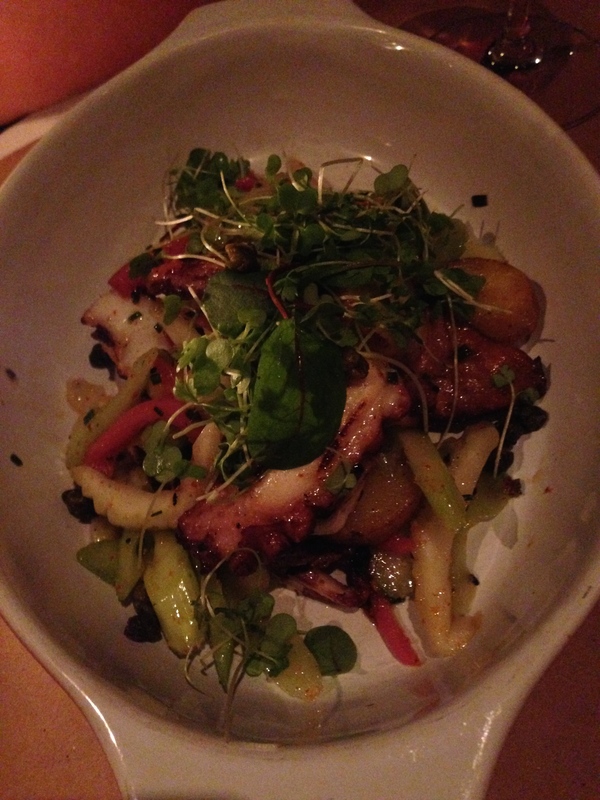 The others try tuna tartare and grilled octopus which is definitely enjoyed. There is an option for a 40 ounce rib eye that we all immediately want to try, so entrée is sorted. 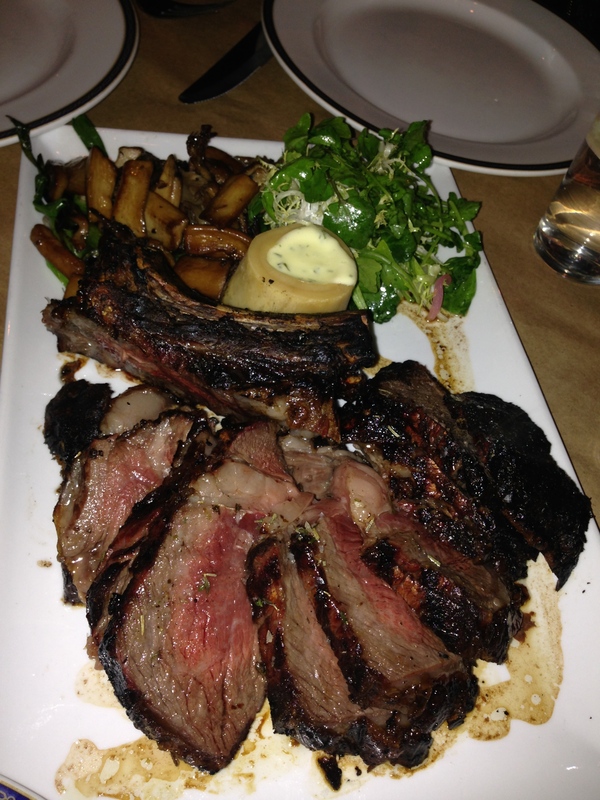 While the rib eye is $140, it comes with several sides of potatoes, salad, mushrooms and a rich bone marrow béarnaise. The rib eye, cooked medium rare, and chargrilled perfectly, just tasted incredible. Add some of the béarnaise and the flavour was turned up a further notch. It was serious steak heaven. Even greater a match was a ripper of a Chianti by Pacina, which had the earthy nose I love, leading to savoury, tobacco notes and a fine but rich berry, lingering on the palate. Carrot cake is something I’ve rarely had for dessert outside of family get togethers at relatives houses as a child. 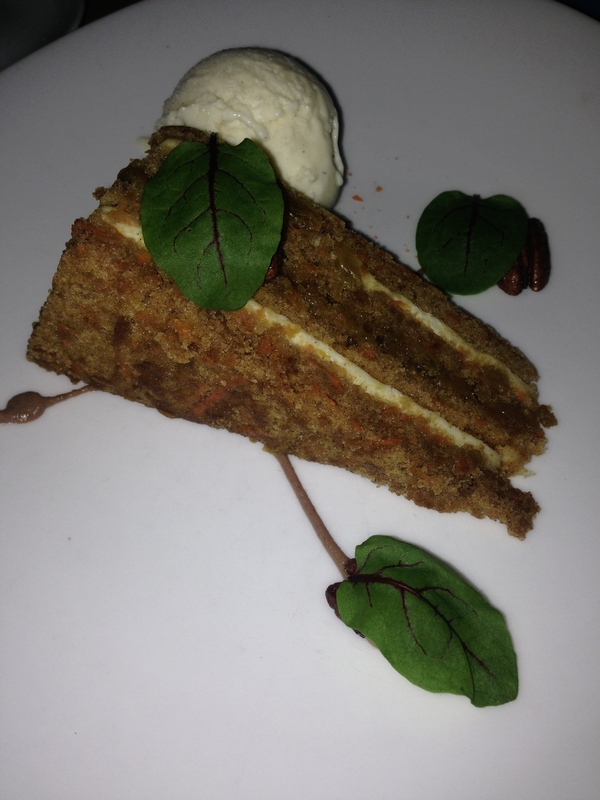 Just like me, the carrot cake at S+P is all grown up! Absolutely divine is the best way I can think to describe it. Even Alana who doesn’t really eat dessert, thought it was amazing. 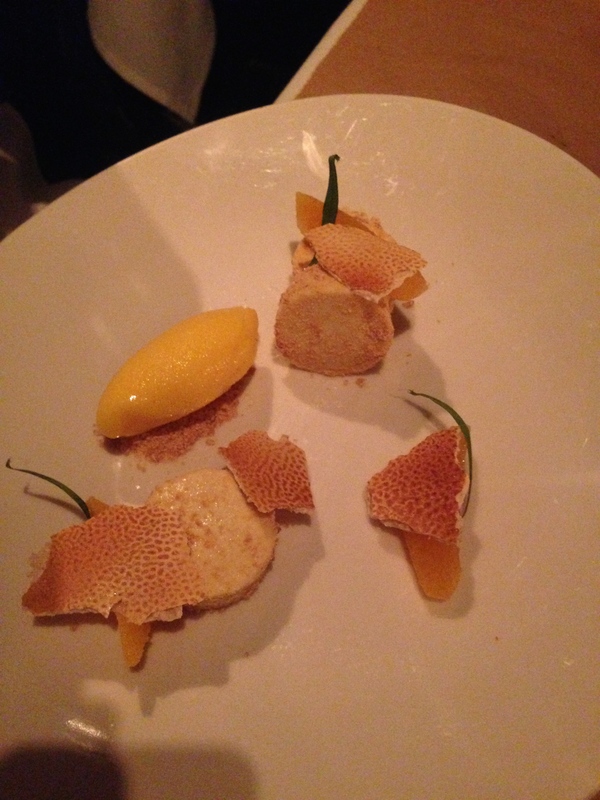 Georg ordered the deconstructed cheese cake, which was tasty, but we expected something completely different. It was one of those meals that had highlights that you do not forget quickly. When I hear ribeye and carrot cake I’m sure I’ll think of Saxon + Parole in years to come. Big Night’s Out. Having been working intensively for a few days after a lot of travel from Melbourne, Australia, I was comfortable in having a mini BNO. Mini because Nougatine is the bar and bistro of the highly acclaimed Jean Georges that is a feature of New York culinary history. The fun part is that you are still greeted by the same reception, wisked to the left entering a room buzzing with the possibilities, and served in a style that is all class. For this there is still a price tag, but it is certainly not as great as the main event. The menu is centered around seafood. Being our first night out in New York, we splashed out on a bottle of chardonnay from Burgundy, but there are a host of more reasonably priced options. 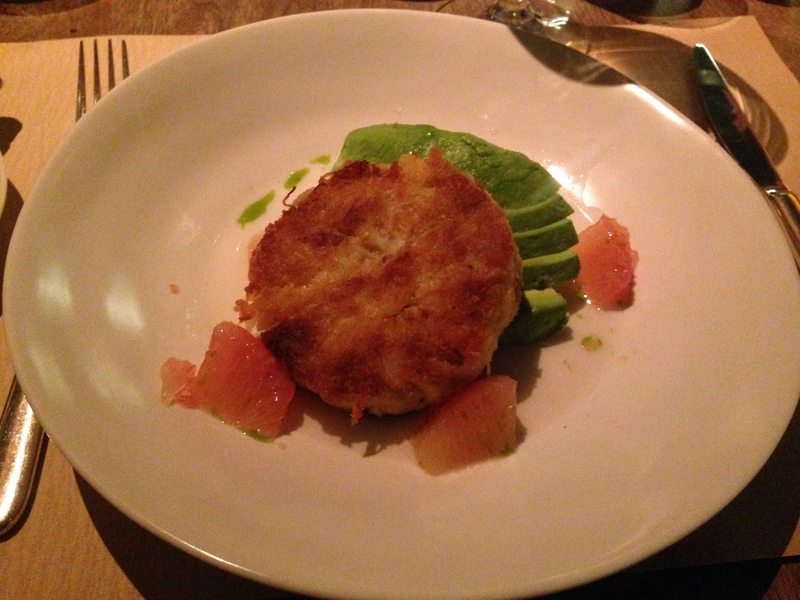 The chardonnay matched both my dishes but in particular my starter of the Peekytoe crab cakes. There is definitely a combination of elegance and indulgence in the amount of crab in the cakes, and the flavour that results. 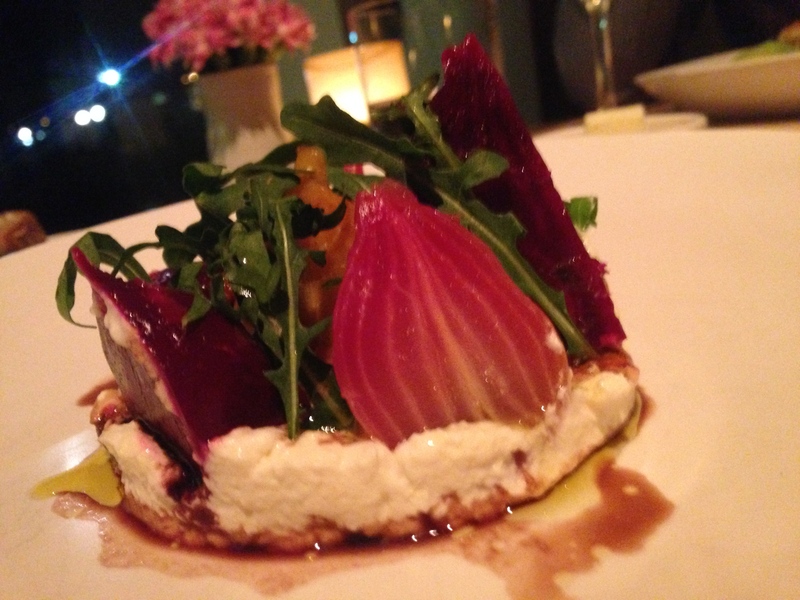 Catherine’s beetroot and goat’s cheese salad is one of the prettiest dishes I’ve seen in sometime, and the taste was in harmony with the presentation. 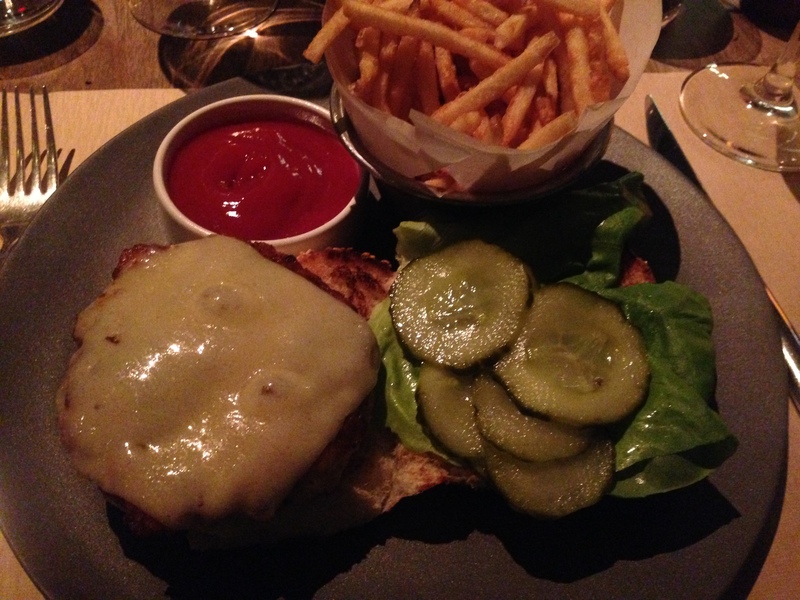 For entrée I went all out decadence and ordered the lobster burger on brioche with pickles and gruyere. It was great but the spices added to the lobster pattie meant that I was eating it too quickly as the heat from the chilli increased and became addictive! 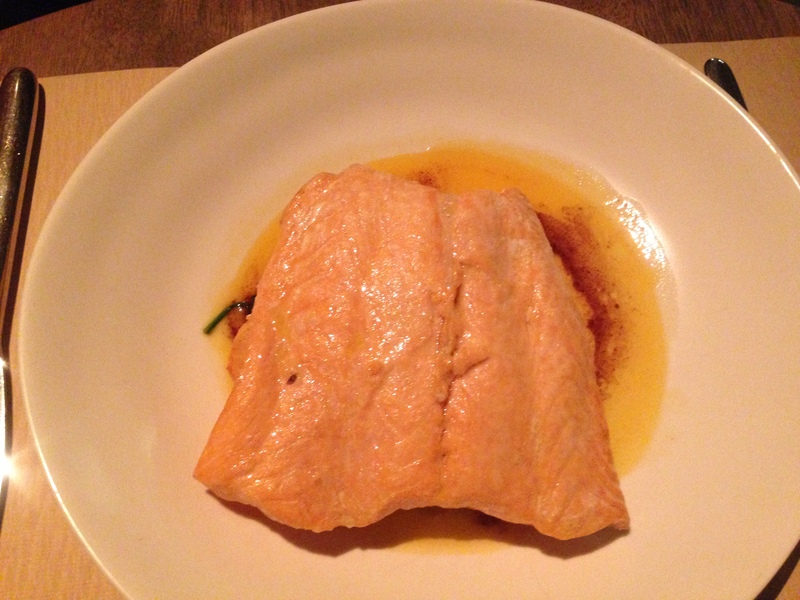 The slow cooked salmon was huge, such a large fillet being perfectly cooked spoke volumes of the calibre of the chefs here. However, we are still not sure about the passionfruit based sauce, which didn’t detract, but didn’t enhance either. 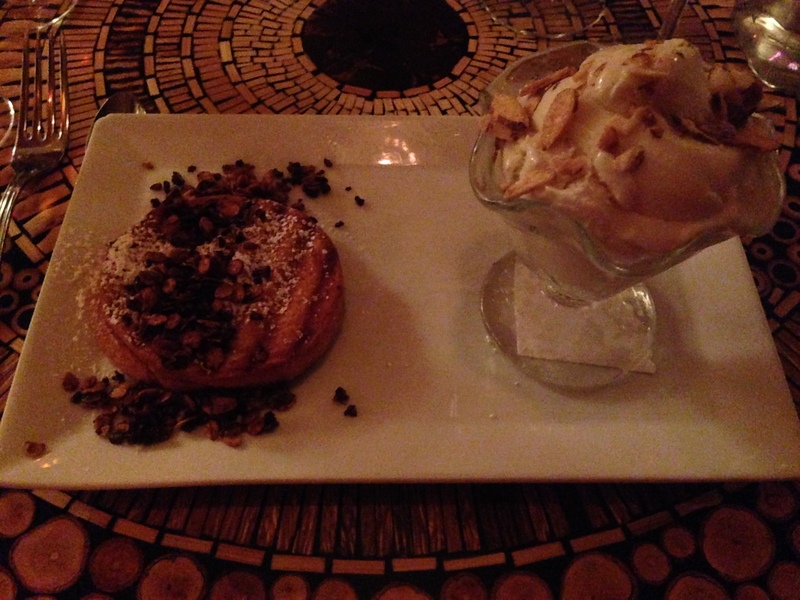 Dessert was a highlight for me in a terrific meal. 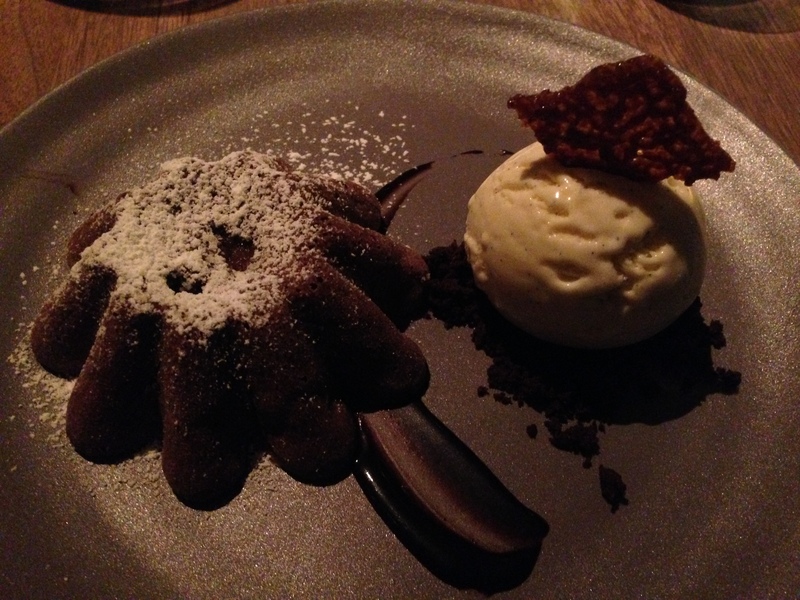 The chocolate cake is a signature of Nougatine and would be challenging to improve in any way. The ice cream offsetting the richness of the cake and equally delicious. 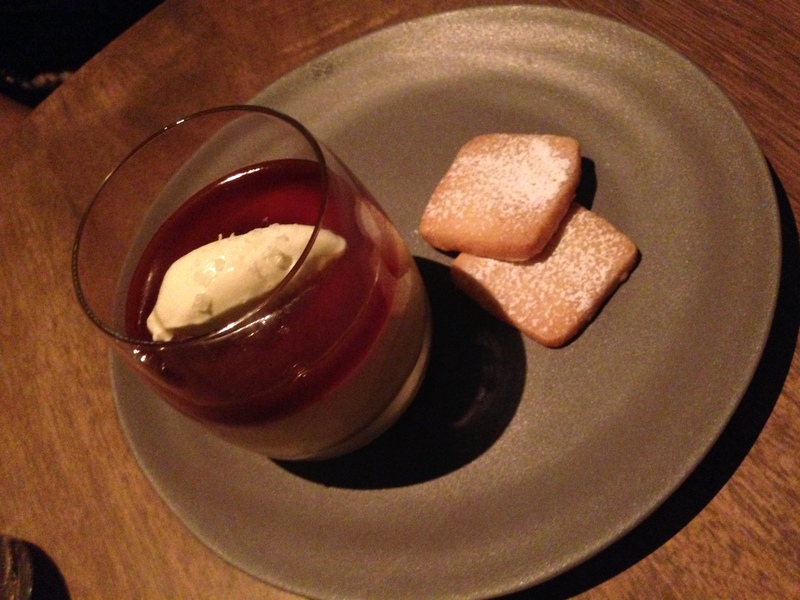 The butterscotch pudding on salted caramel was really good too. Classically presented, it made me think about how good the main event might be. Completely satisfied and buzzing from the experience, we set off for the New York City rooftops on our way to a very late night, which included a visit to Katz Deli! After a day of seeing the sights Boston has to offer, we were back around Harvard to try a Mediterranean restaurant that had been recommended to us by a colleague who worked in Boston for a year. On approach it was hard to spot, reminding me in a sense of the last time we ate near a famous US College at Chez Panisse. Oleana has a neighborhood feel and once you are inside that comfort extends to the warmth of the room, both in literal and figurative terms. We were seated at a table in the main dining room and our waitperson explained the sharing nature of the menu, recommending a quantity of four to six dishes. From the start to the finish service was articulate and attentive with a manner that sat well with the convivial nature of the restaurant. The first dish we shared set the scene for some terrific combinations of Mediterranean flavours, focussing on ingredients most seen in Greece. 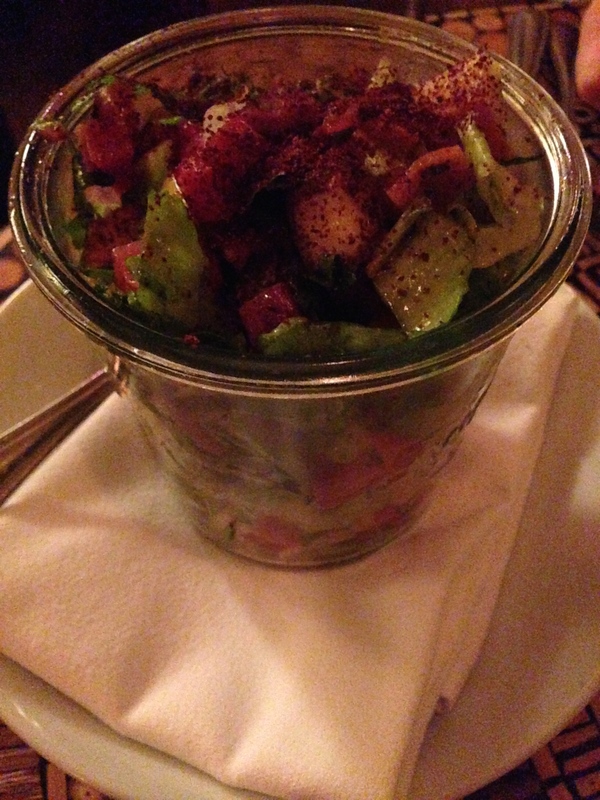 The Apple Fotoush salad was beautifully dressed with a burst of pomegranate in most mouthfuls. The ingredients including cos (Romaine) and beets were all cut nice and small to make it possible to combine the ingredients which were all fresh and vibrant, with a crunch from the crisp pita. Next came the moussaka which had several points of difference to the norm. 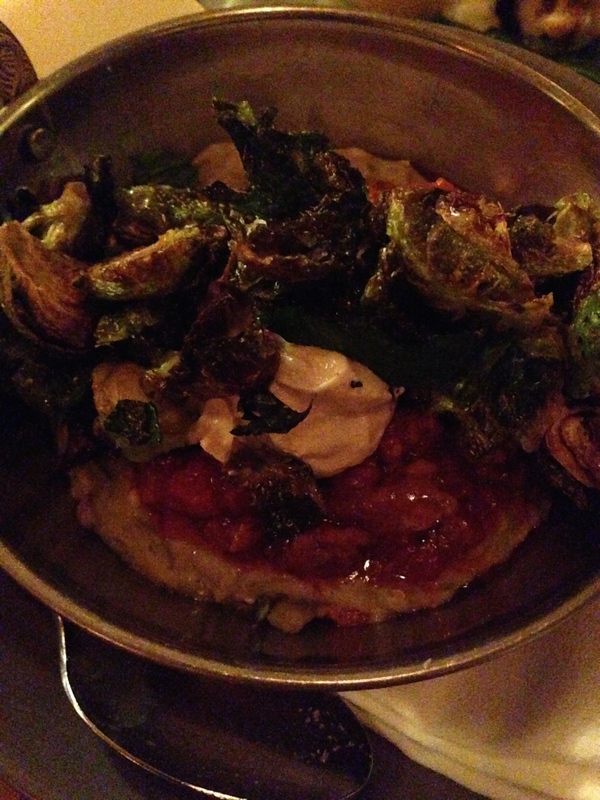 The eggplant layering the bottom presented as babaganoush, and crisp brussel sprouts topping the other ingredients. Fried mussels rounded out our smaller plates. They were nicely cooked, but lacked the zing of the other starters. The Turkish tarator sauce was delicious though. In preparation for dessert we only shared one larger plate which was the duck shish with figs, beets, smoked wheat pilav and walnuts. It was a terrific amount of food and huge in flavour. Whilst contemporary, there was the inevitable thought back to places like Santorini, though unfortunately I didn’t see any duck going around the Caldera! 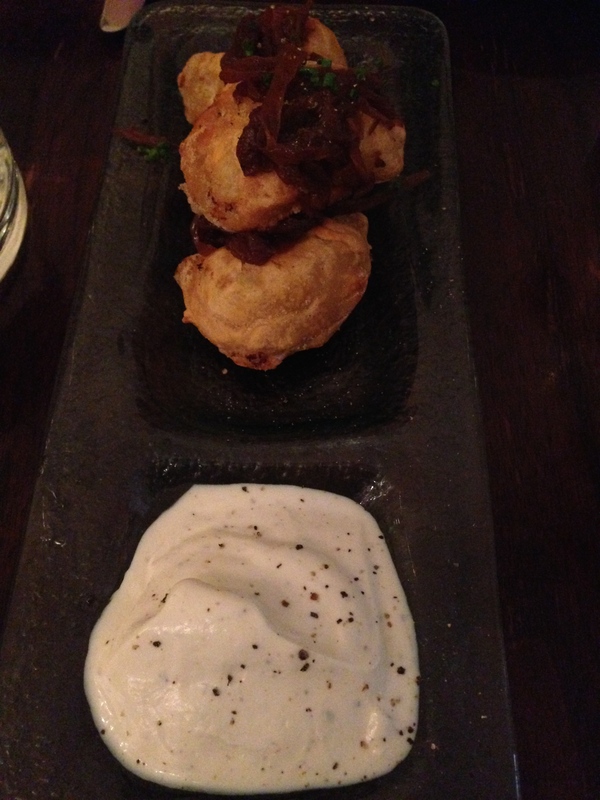 After such a good savoury experience we had to try dessert and one each for that matter. 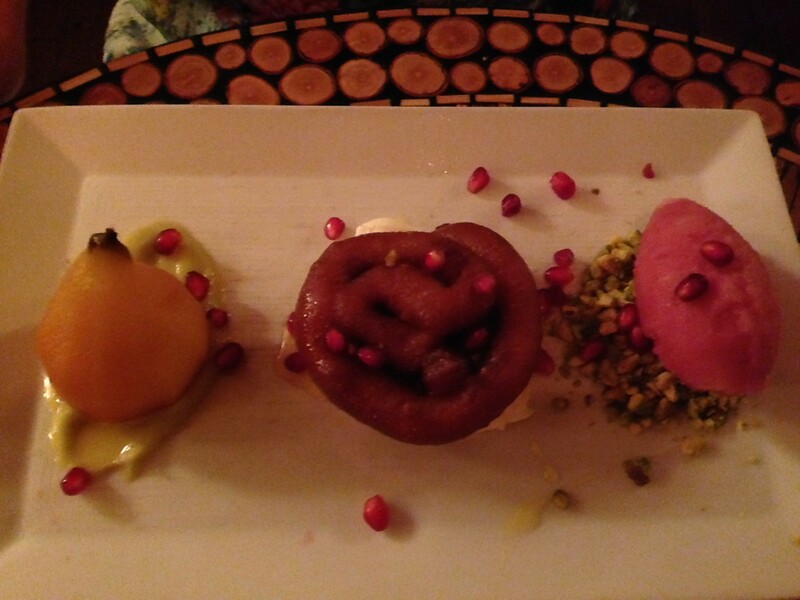 Catherine chose best with the “Saffron Zoulbia, Sekel Pear, Pomegranate Sorbet & Pistachios” which was a delicious combination of Middle Eastern flavours. My almond cremolata, chocolate panino and cocoa nib granola was restrained, with the almond cremolata a little dull, but the technique behind the pastry was executed with skill and my menu envy negated a little. Full on a Monday night, with several larger groups, you could tell this is a constantly customed venue. 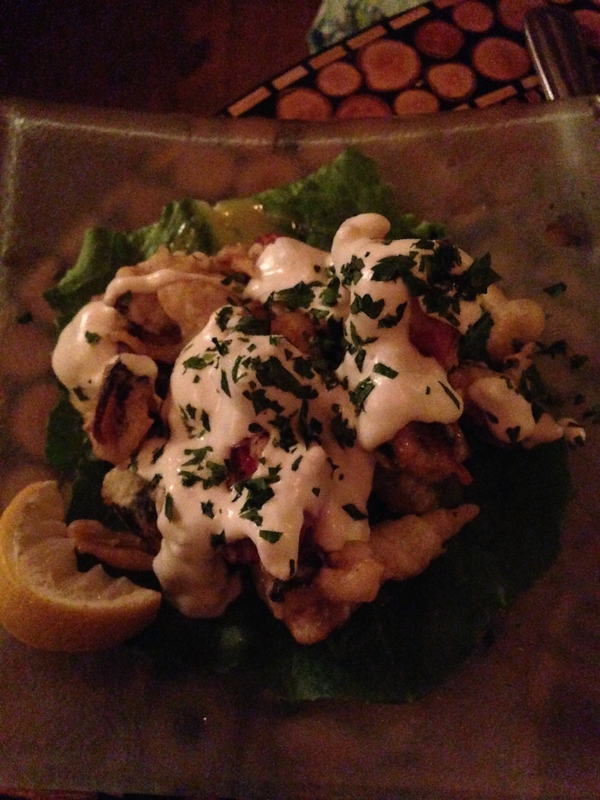 As the wine from a good list flowed, the atmosphere grew, and everyone was satisfied and happy. Oleana is a great restaurant in a city reputed for its food and the chefs are dishing up innovative Meditteranean cuisine that speaks of its origins. Looking up the best Croque Monsieurs in Melbourne reveals a number of obvious results such as Chez Dre, but one I’d forgotten about was South of Johnson. I had a need and SoJo was going to fulfil it. A couple of blocks down from Proud Mary, SoJo is also a bit off the beaten path and feels quiet on a weekend until you get close and see the crowd inside and out. On the two occasions I’ve been I’ve found the staff to be good and energetic, serving a hip and relaxed crowd. 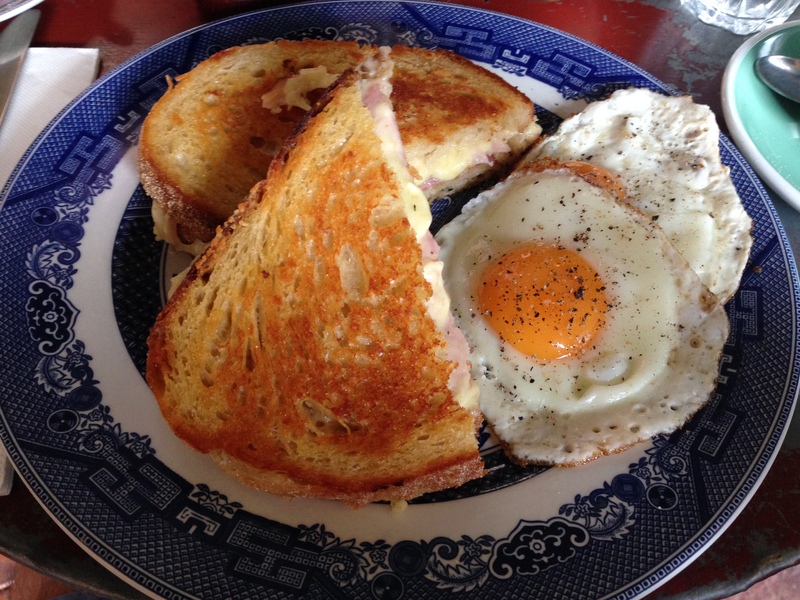 I add fried eggs to the “ham and gruyere” to turn Monsieur into Madame. It is smothered in bechamel and the bread is so rich from the sauce and cheese that you almost could say the ham is holding it together! It is just what the doctor ordered. Catherine’s avocado toast on the other hand is a bit plain. 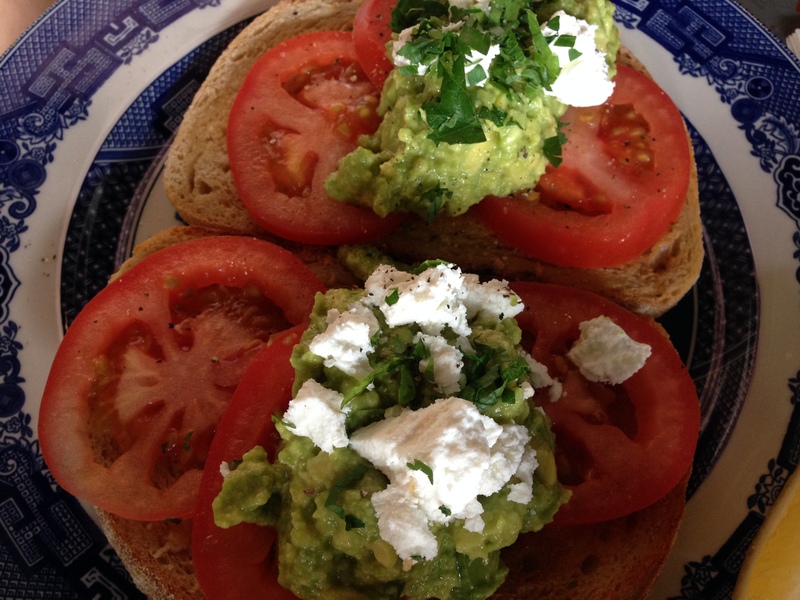 Toast with thick cut tomato, smothered in avocado. There is nothing wrong with it but there is nothing exciting either. The coffee is great and I order several long blacks through breakfast. Unlike many house blends there is a good level of interest and complexity and a slight fruity tone. I should have asked as it could be single origin, but they don’t mention if it is. SoJo is a nice place for breakfast and definitely worth going out of your way for the ham and gruyere. It demonstrates to me the strength in our cafés as in many Capitals this would be one of the best cafés, not just one of the better ones in the area. We are extremely lucky indeed. Walking past a couple of times, and liking the name, was enough for me to check out Big Boy BBQ for a quick dinner. It is thoroughly described on its menu but what sticks out to me is “slow food, fast”. It looks and acts like a fast food joint, but is serving slow cooked quality meats. The similarities to a fast food joint make it a little uncomfortable and I almost walk out and on to one of the many Bridge Road competitors but I stop myself. I’m not sure why but going up to a counter, and ordering from a menu above it, has become intimidating to me! Many of the options are for two people at the very least, so I order The New Yorker on Rye and a Sierra Nevada Pale Ale. As I go to sit down in one of the comfortable booths I see a tray of meat go past and I note that if this sandwich is good I’ll be back with a group soon. 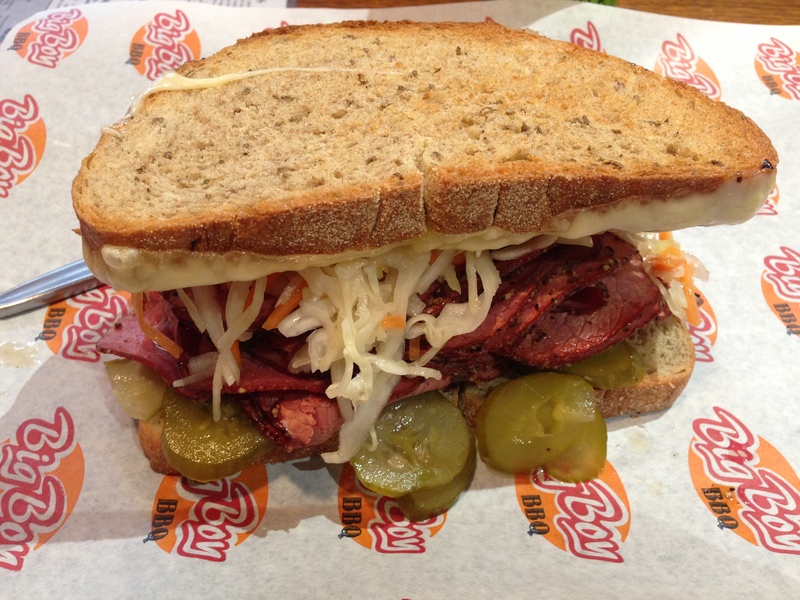 The New Yorker is a classic pastrami on rye with sauerkraut like slaw, and pickles, along with swiss cheese. The thin multi layered pastrami is delicious and surprisingly easy to bite through, adding to the enjoyment of the sandwich. It is a very good amount too, but I think that is fair for $15. One thing I notice, and it is worth mentioning, is that the staff are nothing like fast food joint cashiers. Everyone seems happy, energised and there is a level of attentiveness in the service even though you order at the counter. It was quite refreshing. I was dining early and as it approached 7pm I was glad to see the joint get fuller and get some atmosphere. 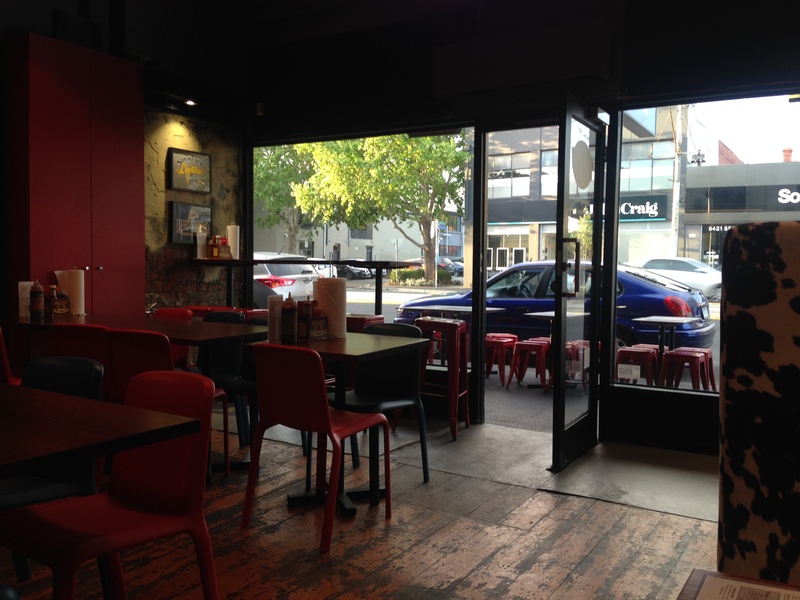 Big Boy BBQ adds another point of difference on an increasingly good strip of Bridge Road in Richmond. It won’t be long at all until I’m back for the meat trays.